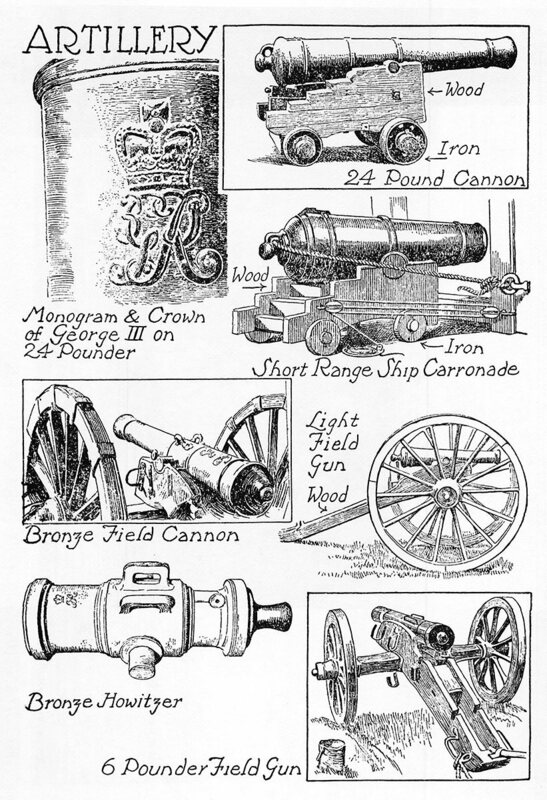 Artillery in Canada during the period covered by this volume consisted of two kinds: stationary cannon, generally of large calibre, used for the defense or siege of forts, and on board warships, and lighter weight field cannon accompanying infantry in fighting in the open. Heavy cannon threw solid iron balls weighing from eighteen to thirty-six pounds; field guns ranged generally from three pounders to eight pounders. In addition to these were mortars and howitzers, short thick cannon, resting on the ground or low carriages, with their muzzles elevated to give a plunging fire, both using exploding shells. The largest guns were of iron, many of the smaller ones, as well as howitzers, were of brass. 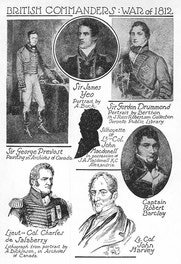 Field guns and ammunition wagons were drawn by horses; in the War of 1812 horses and their drivers formed what was known as the Car Brigade; the horses were hired or requisitioned from the farms, their drivers were hired or impressed civilians. These were sometimes Quakers, Mennonites, or other conscientious objectors to warfare, who were pressed into the service of transporting ammunition and supplies. Transportation of the heavy guns up the waterways was a slow, difficult and expensive undertaking. Oxen were employed in places to haul the boats where the current was too strong for poling. Warships on the lakes were armed with cannon of various calibres, from thirty-two pounders to some as small as two and three pounders. The big guns were of two kinds: long range guns, and carronades. The latter were short thick cannon (so named from the place where they originally were made, Carron Iron Works in Scotland), with a large bore, firing a heavy charge of small projectiles. They did tremendous execution in close action, but were inferior to long guns at a distance of about a quarter of a mile. 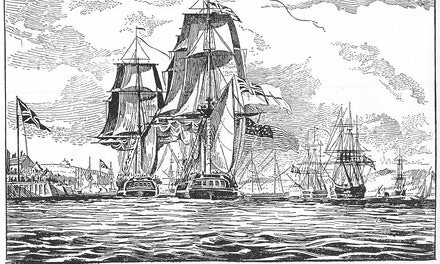 On Lake Ontario the British fleet had more carronades than long guns, consequently it sought to bring the enemy to close quarters, while the Americans manceuvred so as to fight at a distance where their more numerous long guns would give them an advantage. At Plattsburg in 1814, however, these conditions were reversed, and to this and the enclosed space in which the battle was fought, the Americans, to a large degree, owed their success. In all these guns several kinds of projectiles were used, grape shot, shells, and solid round balls. The latter sometimes were heated red hot, so as to set on fire whatever inflammable objects they struck. In the American Fort Niagara today may be seen one of the furnaces used for heating shot. Grape shot were used to scatter bullets among masses of troops. These cannon were all muzzle loaders, fired by inserting a lighted fuse, held by a linstock, a long pole, in a touch-hole near the base of the cannon. When a cannon had to be abandoned it was often rendered useless for a while by "spiking" it, i.e. driving an iron rod or a steel bayonet tightly into the touch-hole. The gun then could not be used until the spike had been drilled out. British officers wore the traditional scarlet coat, with a crimson sash around the waist and knotted at the left. American officers uniforms were dark blue, and lacked the sash.